What did Oscar Wilde, Collette, Empress Eugene of France and King Farud of Egypt all have in common? What set a record price of $258,500 at Sotheby’s in 1990 but the sharp-eyed collector can still find at flea markets for less than $100? Considered by some to be a work of art while by others a mere knick-knack, the surprising answer is the humble paperweight. My first experience with the paperweight occurred while on a tour of the Royal Ontario Museum’s European wing. I told Curator Brian Musselwhite that I just didn’t understand the attention given their highly acclaimed paperweight collection. He responded very politely but left me feeling as I imagine Gertrude Stein must have when, upon telling Picasso she didn’t like the portrait he had done of her, he responded: “You will.” I had to learn more. As with Gertrude Stein and her portrait, so too have I come to love paperweights and recognize their importance to both history and collecting. Paperweights made their first appearance in the mid-1840’s and are a fascinating combination of fine and decorative arts. They reflect the pinnacle of glassmaking. Paperweights were a marriage of ancient techniques for creating the centre of the weight and the modern discovery of glass domes which were special for their magnifying properties. To truly appreciate the small size of many designs, hold a paperweight under room temperature water. The magnification will be lost but the skill of the maker fully revealed. Paperweights are also an ideal symbol of the Victorian Era: created to meet the demands of a growing middle class for objects which combined function with beauty. The years from 1845 until 1860 are generally considered the classic period of paperweights. They became tremendously popular in Europe during this time after which interest faded quickly. The fad for paperweights peaked in the United States from 1851 to 1870. There were periodic revivals in their manufacture and in interest throughout the rest of the 19th and well into the 20th century. 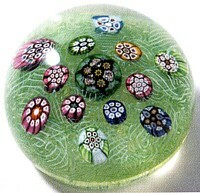 Since World War II, there has been a growing interest in both coollecting and making paperweights. Modern glassmakers have used paperweights as an art form or as an expression of the abstract. For collectors, the Victorian Era is regarded with renewed interest, no longer dismissed as simply a horrible period in decorative history. 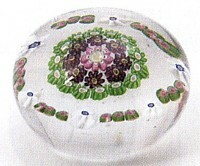 Paperweights made in this century are considered by collectors as modern, while those from the 19th century are antiques. Although many of the modern paperweights are of magnificent quality and sought after, this article will deal primarily with antique weights. Mail delivery in England at the beginning of the Victorian era was expensive. Rates were determined by the number of miles a letter traveled and the number of pages being sent. And all mail was C O D.; charges were paid by the recipient, not the sender. Although mail coaches were among the fastest on the roads, they were still relatively slow. All this was to change in 1840. Railroads replaced coaches as a primary method of transportation and for delivering mail. They were less expensive and quicker. The entire postal system was transformed. One could now send a letter anywhere in England for a penny. Suddenly mailing a letter was not only significantly cheaper but much faster. As education spread, letter writing became the rage of the emerging middle class. Not only did people want paper on which to write their letters but accessories to embellish their desks. Paperweights were a popular example. They were inexpensive, somewhat practical and very beautiful. Everyone had to have one, and where England led, the rest of Europe soon followed. The glassmaker’s art had also been changing. Ancient techniques were remastered, the most significant being growing expertise in the art of making millefiori canes or rods. They were used primarily for jewelry making and scent bottles. The name millefiori comes from the Italian mille (thousand) and fiori (flowers). Millefiori had been widely used in ancient times, and beautiful examples survive from the Romans and Egyptians. The technique seems to have been lost with the fall of the Roman Empire, rediscovered in the 16th century and steadily im¬proved upon until the 1840s. The discoveries of the ancient cities of Pompeii (1747) and Herculaneum (1737) and the resulting revival of neoclassical styles further inspired glass¬makers. The making of a millefiori cane is rather complicated. A simplified explanation is that a lump of hot glass is stretched many feet (sometimes after being pushed into a mold to create a shape) and then broken into workable pieces. These pieces were bundled together and stretched again to create complex canes. If a mold was used to form one of the pieces of glass, the original silhouette was preserved. Some rods were created by twisting two pieces of glass together. This method—filigree—had been used earlier to make stems for wine glasses. Sulphides, another type of paper¬weight, were created by encasing a clay object, usually a cameo, in glass. It was difficult because the glass and the clay contracted at different rates when they cooled and often cracked. The cameo was usually of an historical or important person. 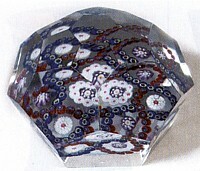 Sulphides were incorporated into paperweights, sometimes combined with millefiori decoration, in the 1840s. 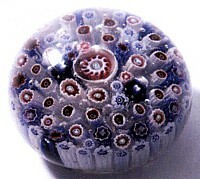 They were very popular, though today they are less in demand than lampwork or millefiori examples. Lampwork paperweights take their name from the gas lamp over which the glassmaker worked. He created tiny representative figures composed of many small bits of glass melted together. These fragile sculptures were heated slowly and covered with a lump of hot clear glass. Lampwork paperweights were very difficult to make because the delicate parts broke easily before and while they were being encased. 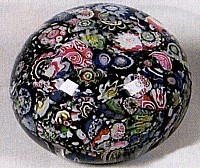 The maker of the first paperweight is not documented, though Pat Reilly notes in his book Paperweights that “it was around 1843 that a Venetian, Pietro Bigaglia, first made millefiori paperweights.” Other theories suggest they were created by glass workers experi¬menting at the end of the day. The mid-1800s were a period of intense competition between various glass manufacturers who were always looking for new, potentially profitable ideas. Regardless of who made the first paperweight, many manufacturers were soon involved in their production. It was three French glass makers—Baccarat, Clichy and St. Louiswho made the most magnificent examples. No other makers were able to achieve the high standards and artistic perfection of these firms. The Baccarat factory was founded in 1764 under the patronage of Louis XV. Baccarat weights are characterized by formality and precision. Fortunately, many of their millefiori weights are signed. Careful searching often reveals a cane with a “B” over a date. The years 1853 and 1858 are especially rare. Also typical are silhouette canes, primarily of an animal. Baccarat’s lampwork weights are never signed or dated. Fruit and flowers were created but never mixed. Baccarat was renowned for beautiful butterfly weights (although owing to their delicate nature, they are often found with flaws such as a broken antenna). Most rare were snakes and lizards on a ground of white muslin, and these command the highest prices. The factory also produced sulphide weights and is still producing limited edition paperweights today. Clichy produced the only known commemorative millefiori weight, which was engraved on the base with a “V.A.” monogram (for Victoria and Albert) under a crown and the inscription “Londres 1851.” Otherwise, their weights are rarely signed or dated. Very rarely, a “C” cane was added, and rarest of all is the full Clichy name in a cane. Both add considerably to value. Millefiori dominated Clichy’s production. The Clichy rose cane, which looks like a bud with the top cut off, is considered a hallmark of sorts, although it does not appear in every weight and was even used by other factories. Nonetheless, weights with roses (the more the better) are preferred by collectors. Clichy used a special boric glass rather than the lead crystal used by both Baccarat and St. Louis. This produced a sharper inter¬nal image and can be helpful in identifying works of the factory. The factory was taken over in 1885, the name changed, and paperweight production ceased. Another French factory called Cristalleries de Pantin was founded in 1850. They did not begin making paperweights until 1878, after the other factories had stopped production. This factory created very realistic lampworked reptiles and animals on grounds landscaped with plants and dirt. Pat Reilly says that such examples are regarded by some as the greatest technical achievement in 19th century paperweight manufacture. Paperweights were produced in other centres throughout Europe and the United States, but none were able to achieve the high standards of the French. In Britain, George Bacchus and Sons of Birmingham made the best quality paperweights. They are rare today as only a few were made: perhaps a total output of only 200 to 300. They used pastel colours rather than the brighter colours found in French examples. Due to their scarcity, prices are high. Weights were also produced in England in the 19th century by the Islington Glass Works. It was believed that The Whitefriars Glasswork company was also a 19th century manufacturer but current scholarship suggests that these weights were instead produced in the 1930s using canes dating to 1848. However, this theory has its detractors. In the United States, paper¬weights tended not to be manufactured on the grand factory scale that dominated Europe. Many makers were immigrants who had worked in the European factories and brought their skills with them to America. Much of their work was done as a hobby or after hours work. The two important lampwork factories were The New England Glass Company and The Boston Sandwich Glass Company. The work of the Mount Washington Glass Company is currently under debate. Experts think some lampwork production previously attributed to this factory was actually made in Russia and Eastern Europe. Canadian paperweights were made by the Sydenham Glass Company in Wallaceburg, Ontario and Burlington Glass Works in Burlington, Ontario from around 1900 to 1910. Compared to the French examples, they appear simple and primitive. They often have air bubbles and the craftsmanship is less sophisticated. Paperweights are divided between collector and gift standards. As the name implies, collector’s weights are those considered suitable for collecting, while gift paperweights are poorer quality novelty items unlikely to appreciate in value or be recognized for their workmanship. The line between the two is somewhat indistinct and final judgment must be made by the collector. Since the 1930s, China and Murano, Italy have been churning out many poor quality paperweights based on old French designs. The quality of the glass has improved from the cloudy yellowish glass used in the early years but workmanship remains poor. The canes are simple, the colours garish and bubbles are prevalent. Newcomers to the field can learn quickly to distinguish these. They are likely to remain gift weights only. Identifying antique weights can be more challenging and requires research. While there are canes characteristic of the 19th century, they were sometimes saved or rediscovered and put into 20th century weights. As well, canes with older dates are put in newer weights. It is still helpful to recognize cane patterns and groupings and the types of work each factory produced. Potential and existing collectors should not be too discouraged. Brian Musselwhite reports finding a lovely antique Baccarat paperweight at the Clarence, New York market for less than $100. Even so, he recommends collecting the finest modern paperweights, believing they will appreciate in value. Even if you have no intention of spending thousands of dollars on a paperweight, visiting a dealer who sells the top of the line is a great way to see and handle the best. Luckily there are many books on the subject. Paul Hollister’s Encyclopedia of Glass Paperweights (1969) is something of a Bible, while his other books are also highly recommended. Care is needed with older books as paperweight scholarship is updated constantly. Museum collections and special exhibitions provide an excellent opportunity to see examples of the rarest weights. Among the finest is The Corning Museum’s collection in Corning, New York. The Paperweight Collectors Association publishes a great deal on the subject, while local collectors often form societies which meet periodically and sponsor speakers. Paperweights should be examined closely. Scratches are part of normal wear and tear, particularly with antique weights; however, most weights have been repolished or reground to remove marks. This can be damaging as it changes the relationship between the outer magnifying glass and the image inside. The interior may look off-centre and uneven, parts of the design may no longer be visible. A weight submerged in water will reveal the undistorted design and is one way to check against poor restoration. Unevenness is a sure sign of regrinding. If you hold the weight upside down on a piece of tissue on your fingertips and carefully move it around, the unevenness will become apparent. Antique weights require care. They should be kept out of bright sunlight, as the clear glass may become cloudy or gray. Rapid temperature changes can cause the glass to crack. Clearly, paperweights have come a long way from the desk bauble the Victorians used to control unruly pieces of paper.